First Choice Mobile RV Repair, owned and operated by Chris Newman, is proud to be serving the Louisiana RV community in Shreveport, Bossier City and surrounding communities. Our goal is simple-- do it right the first time at a rate that does not unhitch your wallet! As your technician, I have been in the recreational vehicle field for many years. From the world of dealerships and repair shops to living my present full-timing RV lifestyle, I believe I have seen it all. I have worked right along side many techs from the big manufacturers including Jayco, Keystone, Forest River, Mobile Suites and many others high volume producers. 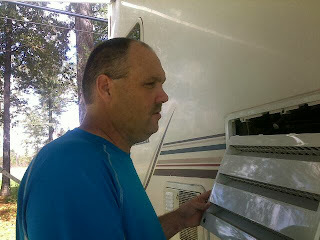 My wealth of information and expertise assists me in diagnosing your issue right the first trip out. A commitment I make to customers is to fix only what is wrong and not try to up-sell you on repairs that are not essential. If it is outside my skill set, you will be the first to know and I will do my best to find a resource to solve your issue. To see fees, click on the Services/Rates tab at the top of this form. You may also Email me at rvdat70@gmail.com.